This week, as we face an overabundance of stories about Black Friday and Cyber Monday, we here at Blog This Rock have a round-up of interesting and engaging pieces about Poetry for you to read! Today, an interview with 2008 Featured Poet Susan Tichy from Cerise Press. Forward widely, and enjoy! The following is an excerpt. Please click here to read the full interview. Both Bone Pagoda and Gallowglass contain overlapping themes of war with cross references from Vietnam, Iraq and Afghanistan. Why (and how) is this overlap in the two books important and meaningful to you? How do you relate this overlapping to your personal memory of similar events? This is hard to answer without a sense of diminishment — by which I mean the two books, especially Gallowglass, would be my reply — but I’ll do my best. I had just begun Bone Pagoda when the 9-11 attacks took place, so, though its subject is Vietnam, it was, from the start, overshadowed by the current wars. There’s a long history of writing about current events in the guise of historical subject matter, from “Flowers of the Forest” — an 18th century Scottish Jacobite lament, ostensibly about a 16th century war — to Bruce Beresford’s Breaker Morant — a film dissecting the ethics of guerilla tactics employed by the British during the Boer War, released in the aftermath of American (and Australian) involvement in Vietnam. I wasn’t exactly doing that — my book really is about Vietnam and I had been preparing to write it for some time before September 2001 — but I could hardly avoid the parallel. Later, there was a period when I was finishing Bone Pagoda but had also begun Gallowglass, so of course there were questions of boundary and inclusion. I think the difference between the two books is one of foreground versus background: Bone Pagoda is a book about Vietnam, written in the presence of our current wars. Gallowglass is not quite the opposite, because its other unifying subject is my husband’s death, but it is a book about the present, into which the past is inextricably woven. Thanksgiving Week Reading Material: 55th Anniversary of "Howl"
This week, as we face an overabundance of stories about Black Friday and Cyber Monday, we here at Blog This Rock have a round-up of interesting and engaging pieces about Poetry for you to read! Today, two great articles about the relevance of Allen Ginsberg's "Howl." Forward widely, and enjoy! Fifty-five years after Ginsberg first read “Howl” at the Six Gallery in San Francisco in 1955, it’s easy to forget how breathtakingly revolutionary the poem was to those hearing it for the first time. Written in the McCarthy era when you could lose your job, be arrested or institutionalized (being gay was considered to be a mental illness until 1973 by the American Psychiatric Association) if you were openly queer, “Howl” is a Whitmanesque work replete with open, explicit gay sexuality and anti-capitalist, anti-military sentiments. Click the link above to read the full text. What the 90-minute art film does well is give time to absorb the dense lines of poetry that are packed heavily with Ginsberg's personal life and the people in it, the socio-political artifacts and ideas of the post-World War II 1950s, and the jazz rhythms of his poetic format that was influenced by Walt Whitman. Interestingly, the presentation of the poetic lines is not linear. Stanzas skipped in one scene might be spoken later. The Dresser couldn't say what the filmmakers' logic for this was, but it certainly did not interfere with the integrity of the poem. if not today then tomorrow. the journey we are on, the poet's path. Today I returned my poems to my lover. 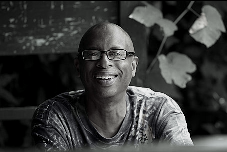 E. Ethelbert Miller is the author of ten books of poems, two memoirs (most recently The 5th Inning ) and editor of four anthologies. He is Board Chair of the Institute for Policy Studies and the Director of the African American Resource Center at Howard University. He is also the editor of Poet Lore magazine. Miller was a featured poet at the 2008 Split This Rock Poetry Festival and appeared on the panels "Reclamation, Celebration, Renewal, and Resistance: Black Poets Writing on the Natural World" and "What Makes Effective Political Poetry? Editors' Perspectives" at Split This Rock 2010.
the edges of the dark. scold and kiss our children. life is precious, move on. we stir all night. We pray. From This Side of Early (Curbstone Press 2008). Used by permission. Naomi Ayala is the author of This Side of Early and Wild Animals on the Moon. She teaches at The Writer's Center in Bethesda, MD and the Joiner Center for the Study of War and Social Consequences at UMASS-Boston and serves on the Board of Directors of DC Advocates for the Arts. Ayala was a featured poet at the 2008 Split This Rock Poetry Festival and appeared on the panel “Women & War/Women & Peace: International Voices” and read as part of the Beltway Poetry Quarterly celebration at Split This Rock 2010. Thursday, November 11th, 8:00 p.m.
Thomas Sayers Ellis (a 2010 Split This Rock panelist) is an award-winning poet who is currently an Assistant Professor of Writing at Sarah Lawrence College. Ellis will be reading from his newest collection, Skin, Inc.: Identity Repair Poems, which combines lyric sequences and his own photographs to create an image for America. 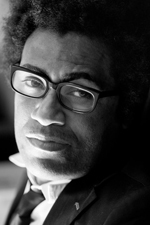 Ellis includes many references to pop culture in his work, including the death of Michael Jackson and the election of Barack Obama, His poems have appeared in many journals and anthologies, including Callaloo, Best American Poetry, Grand Street, The Baffler, Jubilat, Tin House, Poetry, and The Nation. He has been the recipient of the John C. Zacharis First Book Award for his book The Maverick Room and a Whiting Writer's Award. through the grammar of another way of life? still bearing that cutting edge? like the people living among them --their desiccated hope? we'd worked so hard to own. what had already killed them. with what we would never learn to see. 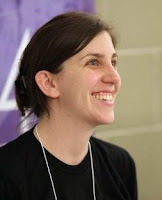 Jaime Lee Jarvis is a professional editor, trained technical writer, and environmental activist. She visited the ship graveyard in the town of Muynak in 1999, when she was a Peace Corps volunteer in Uzbekistan. A decade later, news about the ongoing ecological disaster and human tragedy surrounding the shrinking Aral Sea has largely disappeared from public view. Jarvis was volunteer coordinator for the first Split This Rock Poetry Festival in 2008, and now serves on Split This Rock's board.